Periwinkle Creek on the afternoon of Oct. 12. If you want to buy a shopping cart, you can find one online for about $150. They are not, in other words, free or even cheap. You would think that stores are concerned about the theft of an item that costs $150 or thereabouts to replace. But so far they haven’t managed to prevent this type of loss. More than five years ago, in June 2008, Albany passed an ordinance intended to stop if not the theft of shopping carts then at least the dumping of stolen carts all over town. The ordinance required stores to put their names and contact information on shopping carts so that when they were found abandoned, the store could be called to pick them up. Easier said than done, especially when the carts are under water, as in Periwinkle Creek. 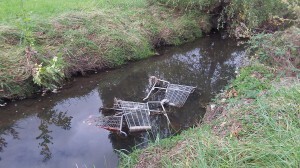 In 2008 a city official described the creek, near the MegaFoods supermarket on Queen Avenue, as the most popular cart-dumping site in town. Not much seems to have changed. On Saturday I counted these three and a fourth downstream. From Ted Salmons: I remember when you addressed this subject years ago and it seems the city had written its ordnance to put the enforcement burden more on the stores than on the thieves and then apparently mandated no reporting requirements from the police to the stores when they discover these carts. That’s just an assumption by the number of carts out there on the streets. Yes, thieves is a harsh word but if you’ve taken or are using something that doesn’t belong to you what other word fits? … Just about every time I drive through Albany I see someone headed down a sidewalk with a shopping cart. And since I’m fairly sure 99 percent of these people don’t actually own it, by definition the carts are stolen. Now I’m not suggesting these people be hauled off to jail. Not a great use of police assets. But….. for the price of a piece of chain and a decent lock (less than $15) when the police see someone with a “borrowed” cart they could “arrest” the cart, chain it to an immovable object and cite the thief. Then drop the key off at the local Fred Meyer/Dollar Tree/Safeway etc. and tell them where there property is. I believe when stores started getting their carts back they would be more than glad to get the chains and locks back to the police so they could be reused. If the police believe stopping someone with a stolen $150 shopping cart is “beneath” them, then why do they respond to stores when they detain a shoplifter? Do they ask the value of the items stolen and say, sorry Sears/Fred Meyer/Target, anything less than $150 is below our “level of enforcement.” Just saying. If you’re not going to enforce a law or a rule why write it in the first place? Jim Clausen, on Facebook: Interesting, people steal shopping carts from stores and city government decides to make a law that governs the stores. Rather than go after the criminal they go after the victim. On any given day, the park bordering Periwinkle Creek has homeless people using these carts to store their goods. If the city would stop blaming the victim and instead go after the perp they might have a better chance of solving the problem. But hey, the liberal minds running our city government are going to blame the evil corporations and defend the innocent and abused homeless, right?